On the afternoon of April 12, 2019 local time, Premier Li Keqiang met with Prime Minister Viktor Orban of Hungary in Dubrovnik. 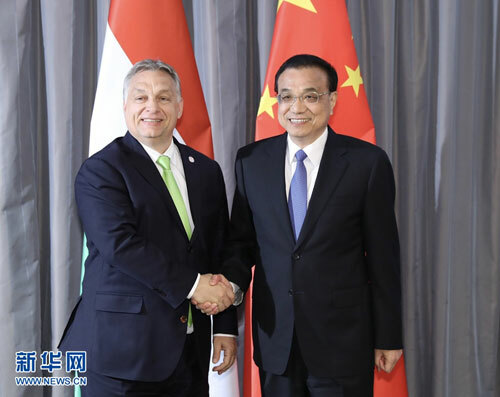 Li Keqiang noted that this year marks the 70th anniversary of the establishment of China-Hungary diplomatic relations, adding that the bilateral relationship is at its best time in history. The Chinese side is willing to, together with the Hungarian side, maintain close high-level exchanges, consolidate political mutual trust, and promote practical cooperation for more progress. Li Keqiang called on the two countries to enhance communication and coordination through their joint economic committee, and steadily advance major project cooperation, including the Hungarian section of the Belgrade-Budapest railway. China welcomes high-quality products, including Hungary's agricultural products, to the Chinese market, and encourages competent Chinese enterprises to invest and establish business in Hungary through open tendering. China also supports more citizens in traveling to Hungary, and is willing to expand exchanges and mutual learning in people-to-people and cultural engagement and education, so as to consolidate public support for stronger bilateral relations. Viktor Orban expressed that Hungary and China will jointly celebrate the 70th anniversary of the establishment of diplomatic relations this year. The Hungarian side is willing to continue deepening practical cooperation with the Chinese side, accelerate the implementation of such infrastructure construction projects as the Hungarian section of the Belgrade-Budapest railway, and enhance the alignment of cooperation in areas including agriculture and tourism. Hungary expects to draw up a development plan for future Hungary-China cooperation to promote bilateral relations. The Hungarian side is glad to see that the European Union-China relations are moving forward smoothly, and will make further efforts to sustain this momentum.